The Alberta Crown Attorneys' Association took the unusual step of calling a news conference Wednesday after Edmonton's chief crown prosecutor stayed 15 separate criminal prosecutions because of a lack of resources. Prosecutor James Pickard says prosecutors are having to stay criminal charges because there aren't enough staff to deal with them. The justice system in Alberta is facing a crisis, according to Crown prosecutors. The Alberta Crown Attorneys' Association took the unusual step of calling a news conference Wednesday after Edmonton's chief Crown prosecutor stayed 15 separate criminal prosecutions on Feb. 28 because of a lack of resources. Those charges included impaired driving, assaulting a police officer, and weapons charges. 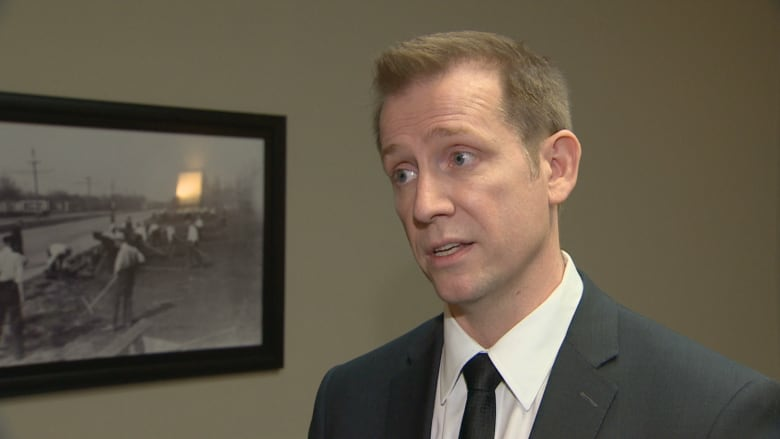 The choice to stay charges because of a shortage of prosecutors is affecting the whole province, said James Pickard, assistant executive director of Specialized Prosecutions with Alberta Justice. "Since January 2017, all across Alberta, we are confident in stating that approximately 200 significant charges have been stayed due to a lack of resources," he said. In Edmonton in December 2016 alone, 20 charges were abandoned because there were too few Crown prosecutors to see them through, he said. Justice Minister Kathleen Ganley acknowledged the short staffing to be a problem. "We're concerned as well," she said. "Over a number of years, the number of matters in court have increased and the number of prosecutors has not increased at the same rate." Alberta Justice has not added any new positions to the Alberta Crown Prosecution Service since 2010. The number and severity of criminal charges have grown in Alberta, with over 250,000 criminal charges laid in 2015-2016, said Pickard, emphasizing that's a nearly 10 per cent increase over the previous year. "Alberta's Crown prosecutors are fighting a losing battle to keep up with the increasing number of significant criminal offences," he said. Pickard said "years of neglect," along with the current provincial hiring freeze, are to blame. The government needs to drop the hiring freeze and fill the 35 vacant positions that currently exist, he said. In Edmonton, there is a 16 per cent vacancy in prosecutors based on 2006 levels, said Breena Smith, a Crown prosecutor in Edmonton. Prosecutors have left or retired and their positions haven't been filled, she said. Criminal defence lawyer Kelly Dawson said although the situation appears politically charged with the provincial budget coming down this month, the Crown prosecutors raise real issues. "We've actually done a little bit of work to figure out, trying to be reasonable in a time of fiscal restraint, what we need as a first step," Pickard said. "We think that 50 Crown prosecutors is a legitimate, fair, first step to start addressing the problems within the prosecution service." The ministry said in an email that it is actively recruiting 14 to 16 prosecutors across the province right now. Eight to 10 of the positions are in Edmonton, four are in Grande Prairie and one is in St. Paul. Dawson said he's also met with the province over concerns about the ongoing need for increased legal aid funding. "I think it's got to the point that the prosecutors are so frustrated because they've been dealing with staff shortages ... that they decided to make a political statement as opposed to try to make this work," he said. "The government has been receptive to meeting with us, consulting with us," he said. "But at some point you wonder if they're really listening to anything other than public pressure."